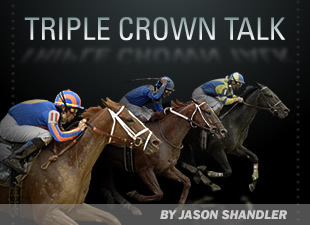 We're now just a few days away from the New Year, which of course means that juveniles will be officially turning 3 and the Triple Crown trail will launch into full swing. It is impossible to talk seriously about the Kentucky Derby without mentioning Bob Baffert. There is no better trainer at preparing young horses for a run at the Triple Crown and it looks like the California-based Baffert will once again be loaded in 2011. And he will be even better prepared this year now that Santa Anita has returned to dirt. Earlier this month I wrote about a few of Baffert's key horses to watch, including The Factor. Last Sunday, the son of War Front rebounded from a disappointing debut with a jaw-dropping maiden win in which he broke Santa Anita's six-furlong track record in 1:06.98 while romping by more than eight lengths over a good field. The Factor, a $250,000 purchase at Barrett's May sale and out of the Miswaki mare Greyciousness, did what Baffert expected he would do in his first start, which was jump to the lead and run everyone into the ground. Well...kind of. He didn't expect him to go that fast. Rafael Bejarano was in the irons. "He's a horse we've always been very high on. He has a lot of potential. The first race, we didn't want him going too fast but the jockey kind of grabbed him and then he got boxed in and had no chance. We never got a chance to see how he could run. "I worked him just before this last race and he went a half in :47 and change. It was very impressive so I knew he was going to run well. He was just bouncing over the track. He came back after the race and didn't even take a deep breath." Baffert said he has not yet decided where The Factor will go next, saying only that he will go right into stakes company. However, when asked about his soon-to-be 3-year-olds as a whole heading into next year he said: "I don't know yet. Some of them look pretty good but last year we had a cannon (Lookin At Lucky). That's what you hope for, a cannon. I'm not sure yet, but The Factor looks like a cannon. He's brilliant." The Factor earned a 102 Beyer on a track that was playing incredibly fast that day. Speaking of those other Baffert horses, he also had a very good-looking maiden winner on Monday. Uncle Sam (Tapit-On the Town, by Pleasant Colony) broke his maiden by 2 3/4 lengths going one-mile on the Santa Anita dirt in his debut. Uncle Sam, who runs for prominent owner Kaleem Shah, was a $210,000 Keeneland yearling. Baffert was impressed. "We knew from the beginning he was a two-turn horse," Baffert said. "We thought about running him short but he probably wouldn't be that good so I entered him in this turf race hoping it would come off--which it did. I like how he re-broke in the stretch; he looked pretty good. "I'm not sure what we'll do with him next. We're still waiting on all of these horses, they are still maturing. It's all about timing." Baffert is also still high on Norfolk (gr. I) winner Jaycito, who was transferred to his barn by owner Ahmed Zayat after finishing seventh in the BC Juvenile for Mike Mitchell. Jaycito was given time off after that last race and has just recently returned to the track. He will have his first work in a couple of weeks and no race has been picked out. Another top Baffert juvenile, Awesome Patriot, won an allowance race on Wednesday at Santa Anita. It was a scratched-filled race that went to post with just three horses but it turned out to be a good one, as he basically hooked up in a match race with BC Juvenile starter Riveting Reason. Awesome Patriot (Awesome Again--Tizamazing, Cee's Tizzy) ran a quick half mile (:22.47, :46.42) and still fought off Riveting Reason by a half-length after a stirring stretch duel. He finished up in 1:35.05 over the 'wet fast' main track. It was a very nice effort considering he was pinned down on the rail and could have easily folded to a pretty good horse that has been consistently running in grade I company. Baffert had been pointing Awesome Patriot to the CashCall Futurity but decided to go the conservative route and instead run in him the allowance. He was third in the Hollywood Preview on Nov. 20. "I think he has a big future. I'm excited about him," Baffert said before the race. "I didn't want to take too big a leap with him (in the Futurity). When the condition book came out and I saw (the allowance race) I decided to go with that." Also look for two promising Baffert 3-year-olds to return from the sidelines in early 2011. Smash, also owned by Shah, broke his maiden by 2 1/2 lengths at Hollywood in his debut this summer but was sidelined by what Baffert described as a minor stifle injury. He is now back galloping and will begin breezing in January. Smash, by Smart Strike out of Dixieland Band mare Dixie Holiday, was a $400,000 Keeneland yearling. Also look for Coil (Point Given-Eversmile, by Theatrical), who Baffert bought privately before his maiden win in November, to return to training in February. Coil had a knee chip removed recently.